Information that Could Save Your Life! It's inexpensive. It's over the counter. And yet it's one the most powerful ways to boost and protect human health. "Increasing the amount of Vitamin D in the body can prevent or help treat a remarkable number of ailments, from obesity to arthritis, from high blood pressure to back pain, from diabetes to muscle cramps, from upper respiratory tract infections to infectious diseases, and from fibromyalgia to cancers of the breast, colon, pancreas, prostate, and ovaries. It can safeguard pregnancy, support ideal weight management, reduce abnormal cell growth, and stave off infections and chronic diseases! Who would not want these benefits?" 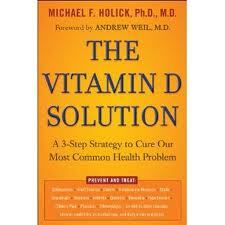 "The Vitamin D Solution written by Dr. Michael F. Holick, Ph.D., M.D.